Your new Jaguar is an investment in quality, so we understand that you want to maintain it in premium condition. To ensure the integrity of the Guaranteed Future Value Program*, your Jaguar must be in acceptable condition when you return it to us and must not exceed the kilometre limit. Of course, we also understand that some reasonable wear and tear is only to be expected, but it needs to remain within the provisions set by your Jaguar Financial Services contract. The acceptable condition of the vehicle takes into account reasonable wear and tear for everyday use, which is outlined in our Fair Wear and Tear Guide. The Guide can be downloaded below. If you have exceeded your nominated kilometre allowance, that will reduce your Guaranteed Future Value. However, this won't affect your ability to trade-in, retain or return your vehicle. ± 1% p.a. 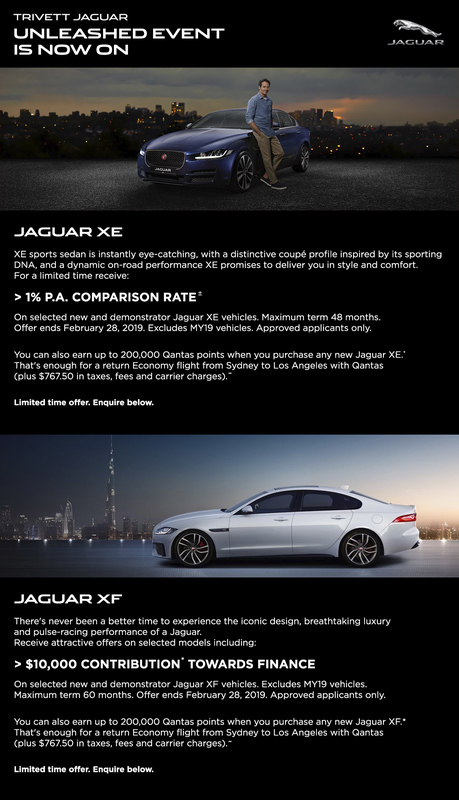 comparison rate only available to approved personal applicants of Jaguar Financial Services (JFS)** for new and demonstrator MY16, MY17 & MY18 Jaguar XE stock vehicles. Maximum 48 months. A lump sum agreed at the time of the loan (“balloon”) may be owed to JFS** at the end of the loan after all monthly repayments have been made. Vehicles sold by 28/02/2019. Customer delivery by 31/03/2019. Finance applications received by 28/02/2019 and approved by 31/03/2019. Offer ends 28/02/2019. Excludes other offers. While stock lasts. Standard fees/charges and further conditions apply, available from JFS**. JFS** may withdraw or change this offer. Comparison rate based on 5 year secured consumer fixed rate loan of $30,000. WARNING: This comparison rate is true only for the examples given and may not include all fees and charges. Different terms, fees or other loan amounts might result in a different comparison rate. Dealer may charge an administration fee to arrange finance, ask dealer for information. **JFS is a trading name of Volkswagen Financial Services Australia Pty Limited ABN 20 097 071 460, Australian Credit Licence Number 389344. EB745. * Qantas Frequent Flyer and Qantas Business Rewards members will earn Qantas Points on new eligible Jaguar vehicles purchased from authorised Australian Retailers. Eligible vehicles exclude used and demonstrator vehicles, any Government or Fleet sales, all on road costs, dealer delivery charges, applicable taxes, vehicle service costs and add-ons such as accessories, branded goods and factory fitted options. Please refer to the Jaguar points earn table for the number of points that can be earned by vehicle model. Qantas Points will be credited to a member's Qantas Frequent Flyer account up to 60 days after the vehicle warranty start date. Qantas Points are earned in accordance with Jaguar Terms and Conditions. ±Finance contribution of $10,000 for new and demonstrator MY16, MY17 & MY18 Jaguar XF stock vehicles to approved personal applicants of Jaguar Financial Services (JFS)**. A lump sum agreed at the time of the loan (“balloon”) may be owed to JFS** at the end of the loan after all monthly repayments have been made. Finance contribution will be credited to your loan amount by JFS** after application approval. Vehicles sold by 28/02/2019. Customer delivery by 31/03/2019. Finance applications received by 28/02/2019 and approved by 31/03/2019. Offer ends 28/02/2019. Excludes other offers. While stock lasts. Standard fees/charges and further conditions apply, available from JFS**. JFS** may withdraw or change this offer. Dealer may charge an administration fee to arrange finance, ask dealer for information. **JFS is a trading name of Volkswagen Financial Services Australia Pty Limited ABN 20 097 071 460, Australian Credit Licence Number 389344. EB745. *Qantas Frequent Flyer and Qantas Business Rewards members will earn Qantas Points on new eligible Jaguar vehicles purchased from authorised Australian Retailers. Eligible vehicles exclude used and demonstrator vehicles, any Government or Fleet sales, all on road costs, dealer delivery charges, applicable taxes, vehicle service costs and add-ons such as accessories, branded goods and factory fitted options. Please refer to the Jaguar points earn table for the number of points that can be earned by vehicle model. Qantas Points will be credited to a member's Qantas Frequent Flyer account up to 60 days after the vehicle warranty start date. Qantas Points are earned in accordance with Jaguar Terms and Conditions.